Michael White is the CEO of The New Mortgage Company. He has seventeen years in real estate as lender, owner, and mortgage originator. He has purchased and sold more than 275 properties for his own account, made hundreds of real estate loans for his portfolio, and originated hundreds of mortgages as a broker. A respectable 521,000 units sold in April, yet inventory for sale increased by 418,000 units. On average inventory is 2.66 million units and currently 4.04 million homes are for-sale (Please see the chart nearby of units for sale. The red line represents an average. Click image for a large view.). Inventory increased to 8.4 months of supply versus the long-run average of 5.8 months and the recent low of 6.5 months last November. 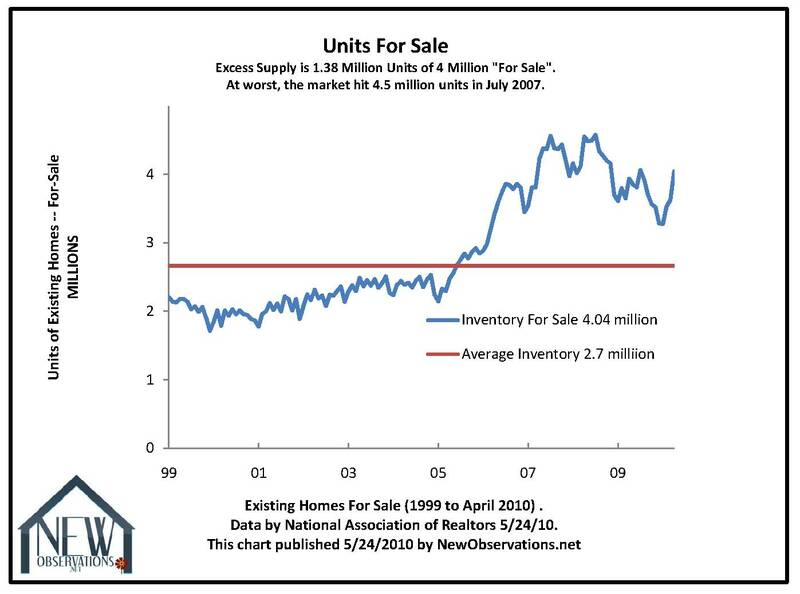 The crash high inventory was 11.3 months in April 2008. Last week the Mortgage Bankers Association said that a record 4.63 percent of homes are in foreclosure. Foreclosures are a major contributor to falling prices. 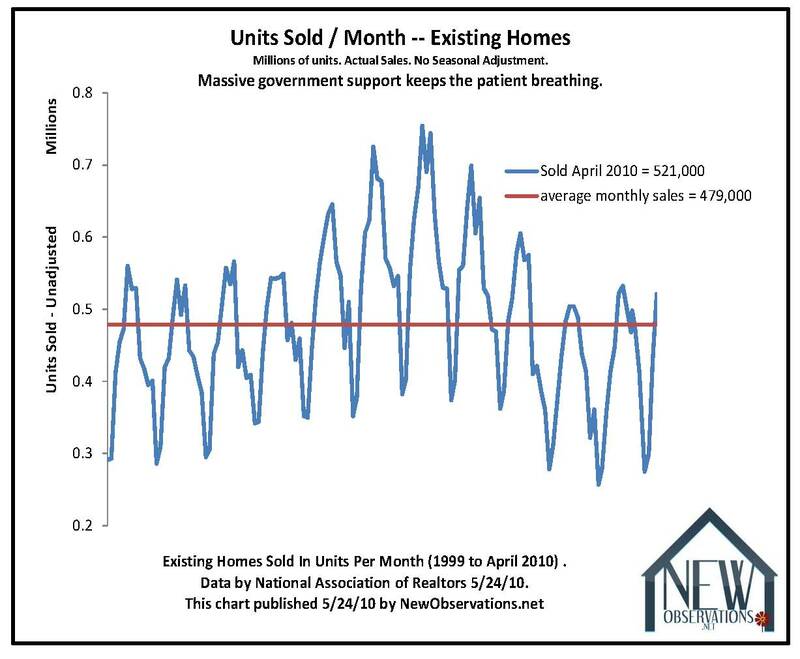 On the positive side of the ledger, interest rates are outstanding right now and affordability has dramatically improved following a 30 percent national loss in home prices which started four years ago. The national median existing-home price was $173,100 in April, up 4.0 percent from April 2009. Distressed sales accounted for 33 percent of the total and all-cash sales clocked in at 250 percent of their normal tally. Nearly 10 percent of current mortgage borrowers are seriously delinquent, being 90-days late or more. New Observations estimated last week that a minimum of one in ten mortgage borrowers will lose their home to the bank in a distressed sale or foreclosure in the next two years. Our real estate market rests on a razor’s edge. On the edge lie high mortgage delinquencies, 12 million homeowners who have no equity or negative equity, high unemployment stuck at 10 percent, and an unprecedented loss in house values which followed a bubble greater by far than any in the last 120 years. Predicting that we are done with falling prices may end up landing north of reckless. 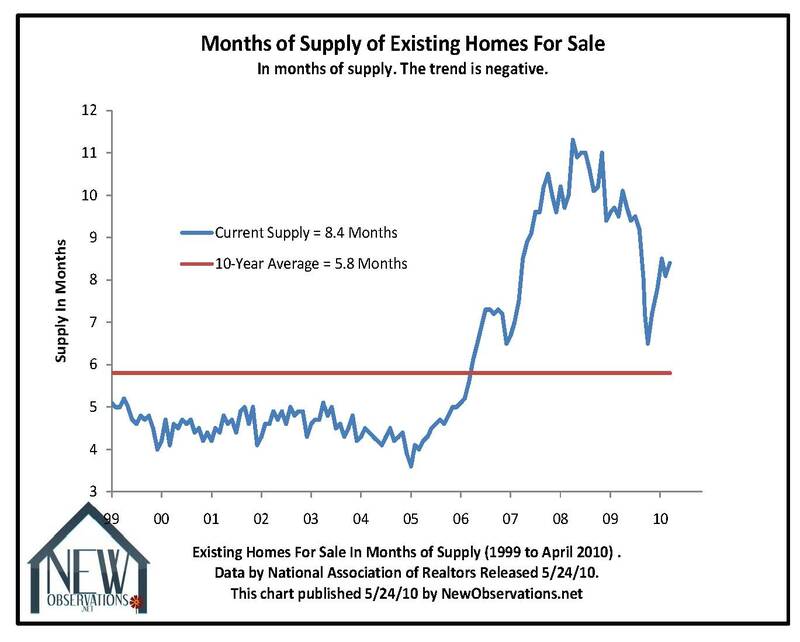 Please see more on NAR at Calculated Risk for inventory and sales. Click for press release from NAR.